The Fall and Spring Exhibitions are open to all MNWS members in good standing who have paid their dues through April 30, 2019. You may join MNWS or renew your membership by sending a separate check for membership dues with your entry fee or you may pay online here. All paintings must be original, two-dimensional works in water-based media on a paper surface (including YUPO), that may or may not be altered (e.g., gesso, gel medium), or on canvas or board that has been treated or coated to accept watermedia, applied in a transparent or opaque manner (no impasto acceptable), and may be finished with acrylic protection versus glass. Exhibitors may display works on gallery wrapped canvas or art boards with at least a ¾” depth. Watercolor or gouache paintings presented on canvas or art board should be protected from possible water damage with a fixative and wax or varnish. Wiring on back should conform to the procedure listed for traditional frames. Collage (no found materials acceptable), if used, must be treated with water media only and subordinate to the overall painting. Drawing elements (ink, pastel, crayons, pencil, etc.) are acceptable. Copies of other artists’ work will not be accepted, nor will copies of published photos or work from photos not taken by the artist. Paintings must be original, completed within the last two years, and not painted in a workshop or under the supervision of an instructor. Works previously shown in a MNWS exhibition are not eligible. Links to register will be available during the registration period on either the Spring Exhibition or Fall Exhibition pages under the “Exhibition” tab. .If you are not a member of MNWS, you will need to join. You may join MNWS or renew your membership by sending a separate check for membership dues with your entry fee, or you may pay online here. The registration form is completed online only. The form requires completion of the painting title, dimensions, and price. When setting the price, note that most galleries charge a sales commission. The amount of the sales commission can be found in the Spring and Fall Exhibit pages. Many galleries require that paintings be available for sale. Payment for entering the show may be made through PayPal with registration or a check made out to Minnesota Watercolor Society can be mailed to the show chairperson. His or her address can be found on the specific show page. Send image (No larger than 1MB) to show chairperson via email. The image should be of the painting only; no mat or frame visible. Be prepared to provide a higher resolution photo of your painting if it receives an award to be featured in the MNWS newsletter. Using the highest setting on your camera when taking a photo of your painting, usually around 2084 pixels at 72 ppi (pixels per inch) or more for one of the settings will be best for printing. 300 dpi (dots per inch) is another way describe acceptable image quality for printing. White, off-white, and light, neutral mats only. No color mats. 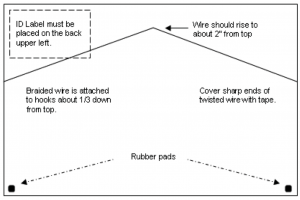 Frames must be neutral, simple, and sturdy and have wire and hooks mounted as specified in the diagram. No color frames. Exterior frame should be no greater than 41” in either direction. ID Labels can be downloaded here. By entering the show, you permit us to make digital images of your exhibited artwork for MNWS archives. These images may be used in an exhibition catalog and/or for publicity. They will not be high-resolution images from which illegal copies of your artwork could be created. If you are an arts organization or an artist and wish to share something with our membership, please post it on our Facebook page. MNWS will not distribute your information to our membership via email. Copyright © 2019 Minnesota Watercolor Society. Powered by WordPress. Theme: Spacious by ThemeGrill.